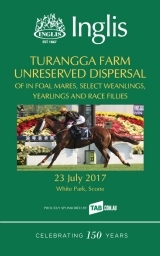 The catalogue for next month’s Turangga unreserved dispersal sale is now online, and it has received some significant pedigree updates in the past week. In total, 92 Lots will be offered at the sale, which will take place at White Park, Scone, on Sunday July 23 from 12pm. Among them are Stakes-winning mares Irish Darling (Lot 48), Niagara Falls (Lot 59), Sojustrememberthis (Lot 67), Tenant’s Tiara (Lot 71), Torah (Lot 73) and Trust Antonia (Lot 74), as well as Brilliant Bisc (Lot 35), the dam of a $1m colt at this year’s Australian Easter Yearling Sale. *Lots 25 and 70 – half-brother to, and dam of My Darling, which won at Sha Tin on May 28. *Lot 66 – dam of Violate, which finished third in the Group 3 Grand Prix Stakes at Eagle Farm on May 27. *Lot 67 – dam of Lucky And Fortune, which won at Macau on May 26. Hard copies of the catalogue will be available within the next week. To secure one, contact the Inglis Sydney office on 02 9399 7999. 4 Withdrawn Lots - last withdrawal at 10:53 am, 22nd Jul 2017. Addictive Nature (2014.c. by Savabeel-Generous Nature, by Carnegie-La Lagune). 2017-07-19 1st ATC (Warwick Farm) Pluck at Vinery H.
Oxbow (Sun) (2012.g. by Encosta de Lago-Cornersoff, by Octagonal-Sky Watch). 2017-07-16 3rd Singapore TC Benchmark 67 H.
Glory Account (2013.f. by Captain Sonador-Optique, by Charge Forward-Cornersoff). 2017-07-01 1st Emerald JC Highlands Financial Planning and Insurance Maiden P.
Mrs Martin (2013.f. by Magic Albert-Luanne, by Redoute's Choice-Countess Christie). 2017-06-02 1st Geelong RC Ritchie Bros Auctioneers H.
TAKING AIM (2014.c. by Choisir-Girl Hussler, by Hussonet-Vecchia Signora). Ivictory (2013.g. by Mossman-Inca Lagoon, by Hussonet-Tyrolean). 2017-06-04 1st HKJC Sha Tin Heights H.
2017-07-16 1st HKJC Medic Kingdom H.
My Gypsy Jane (2011.f. by Teofilo-Manang, by Zabeel-Relations). 2017-07-06 1st Cranbourne TC Procon Developments H.
Miki Two Toes (2009.g. by Patronize-Nippon Pearl, by Marooned-Miss Shergar). 2017-06-10 1st WATC (Belmont) Tabtouch H.
Cosmic Engine (2013.g. by More Than Ready-Astrodame, by Flying Spur-Tirumani). 2017-06-28 1st ATC (Warwick Farm) TAB H.
2017-06-17 1st TLE Newcastle H.
Sebrarian (2013.g. by Sebring-Anabarbarian, by Anabaa-Campbell Fever). 2017-06-12 1st ATC (Warwick Farm) All Too Hard at Vinery Maiden H.
Steamin' (2011.g. by Lonhro-Lamarr, by Quest for Fame-Lupenta). 2017-07-01 1st SCTC (Sunshine Coast) Summerveld Racing Stables H.
Hualalai (2014.c. by Street Cry-Aloha, by Encosta de Lago-Tennessee Midnight). 2017-07-01 1st ATC (Rosehill) Pro Rata Membership 2YO H.
Wongur (2012.g. by All Bar One-Newtown Gypsy, by Danzero-Newtown Pike). 2017-07-01 1st GCTC (GCTC) Aquis H.
Khrysler - Funny Buddies (H.K.) (2011.g. by Sebring-Will Fly, by Will Dancer-Flying Aureole). 2017-06-07 1st HKJC Mount Gough H.
Easy Weekend (2013.g. by Dream Ahead-Country Lodge, by Grand Lodge-Coalition). 2017-06-01 1st Townsville TC Town Automatics and 4WD P.
Champagne Cuddles (2014.f. by Not a Single Doubt-Sky Cuddle, by Snippets-Suggestive). 2017-06-10 1st ATC (Randwick) Club Redfern 2YO P.
Sunset Jewel (2013.f. by Al Maher-Blue Ruby, by Lonhro-Mardi's Magic). 2017-06-08 1st Wyong RC Figtree Estate Maiden P.
2017-06-29 1st Wyong RC Nailed it Projects H.
Lipsync (2013.f. by Snitzel-Watch My Lips, by Royal Academy-Mardi's Magic). 2017-06-14 3rd SCTC (Sunshine Coast) Queensland Cup Raceday H.
Barcelona Bound (2010.g. by Tale of the Cat-Watch My Lips, by Royal Academy-Mardi's Magic). 2017-06-24 1st Roma TC Sport of Kings H.
Pluck That - Winwin Ruby (H.K.) (2013.g. by Pluck-Spirit of Karlu, by Dubawi-Devils Marble). 2017-06-25 1st HKJC Jasper H.
ROSA IMPERIAL (2013.f. by Pivotal-Rose Trail, by Kingmambo-Mannington). Metallic Moon (2013.g. by Snitzel-Silver Moon, by Platinum Scissors-Midnight Renegade). 2017-07-13 1st Clarence River JC North Rivers Concrete Big Maiden H.
Don't be Shy (2011.f. by Bradbury's Luck-Celtic Courage, by Giant's Causeway-Late Night Fun). 2017-07-13 1st Ballarat TC Craigs Royal Hotel Highweight H.
Magic Mouse (2011.f. by Shamardal-House Mouse, by Zabeel-Cotehele House). 2017-06-10 1st GCTC (GCTC) Youfoodz H.
Her Command (2012.f. by Commands-Villa Igea, by Papal Power-Wycombe). 2017-07-11 1st Geelong RC No Fuss Event Hire Maiden P.
Percussion (2013.g. by Foxwedge-Wooden Melody, by Woodman-Theme Song). 2017-06-15 1st Shoalhaven City TC Hanlon Windows Maiden P.
Gogo Grace (2013.f. by New Approach-Starmon, by Monolith-Starnui). 2017-06-17 1st SAJC (Morphetteville) Adelaide Galvanising H.
Stately Lady (2013.f. by Skilled-Irreversible, by Last Tycoon-Villa Igea). 2017-06-18 1st Muswellbrook RC Pluck at Vinery Stud Maiden P.
She's So High (2014.f. by I Am Invincible-High Achiever, by Exceed and Excel-Cash for Comment). 2017-06-28 1st MRC (Sandown) Resimax 2YO P.
Ocean Jewel (2014.f. by Ocean Park-Markisa, by Danehill-Marquise). 2017-06-28 1st WATC (Belmont) Ascend Sales Trophies 2YO P.
BROOKLYN BAY - KELOWNA STAR (MAC.) (2011.g. by Sufficient-Middlebrook, by Royal Academy-Klairessence). Getty (2014.g. by Excelebration-Cousin Katerina, by Stravinsky-Dispersal). 2017-07-15 1st Waikato RC NZB Insurance Pearl Series 2YO S.
2017-06-10 1st WRC Platinum Homes Taranaki Maiden S.
Convincible (2011.g. by I Am Invincible-Gold Licence, by Hussonet-Special Licence). 2017-06-07 1st HKJC Wong Nai Chung Gap H.
I'll Fly Away (2012.f. by Galileo-Twyla, by Danehill-Dancing Show). TROJAN HARBOUR (2014.c. by Harbour Watch-Salma, by Encosta de Lago-Salameh). CERRO (2010.c. by Mr Greeley-Ballette, by Giant's Causeway-Russian Ballet). LOCKDOWN (2014.f. by First Defence-Rising Tornado, by Storm Cat-Silver Star). MAJESTIC PRIDE (2012.c. by Artie Schiller-Blush on Cue, by Theatrical-Goldminess). SEPTEMBER (2015.f. by Deep Impact-Peeping Fawn, by Danehill-Maryinsky). 2017-06-08 1st Leopardstown Irish Stallion Farms 2YO Fillies Maiden S.
ARABIAN HOPE (2014.f. by Distorted Humor-Achieving, by Bernardini-Teeming). HIGH NOON RIDER (2012.c. by Distorted Humor-Modesty Blaise, by A.P. Indy-Chimes of Freedom). STEEL CUT (2011.f. by Cactus Ridge-Oklawaha, by Carson City-Apex Princess). El Tren (2011.g. by Danehill Dancer-Dhamma, by Broad Brush-Piquetnol). 2017-06-29 1st Tipperary Tipperaryraces.Ie H.
Analyze the Odds (2015.c. by Overanalyze-The Sense Angel, by Mineshaft-Sense of Class). Caesar Imperator (2011.c. by Holy Roman Emperor-Captivating, by Wolfhound-Winning Appeal). SUFFUSED (2012.f. by Champs Elysees-Scuffle, by Daylami-Tantina). BUYING TROUBLE (2013.f. by Hat Trick-Lotus Sutra, by Kingmambo-Visions of Clarity). Elusive Queen (2014.f. by Shaweel-Elusive Force, by Elusive City-Sopran Rahp). Picadilly Circus (2012.f. by Not for Sale-Sunday's Edition, by Gulch-Main Edition). Ferrero Rocha (2012.f. by High Chaparral-Larrocha, by Danehill-Kensington Gardens). 2017-06-03 2nd Kenilworth Soccer 13 H.
Evanesce (2013.f. by Reset-Rena's Lady, by Arena-Boisterous Lady). 2017-06-27 1st Newcastle JC Xmas Parties P.
Murt the Flirt (2011.g. by Murtajill-Loves Attention, by Taimazov-Party Miss). JACKO'S (2013.c. by Seeking the Dia-Damajuana, by Dushyantor-Detallada). Lebombo Rose (2013.f. by Artie Schiller-Lebombo, by Johannesburg-Kensington Rose). 2017-06-29 1st Ballarat TC Craigs Royal Hotel Maiden P.
Redefine (2013.g. by Captain Rio-Miss Defy, by Grosvenor-Nippoh Madonna). 2017-06-03 1st Wanganui Chronicle H.
2017-07-01 1st Hawkes Bay T Lee and Ara H.
2017-06-23 1st Otaki Maori RC Vets on Riverbank H.
SELF SENSE (2010.g. by Street Sense-Be My Person, by Personal Flag-Kiwi Rose). Floral Fever (2012.g. by Floral Pegasus-Insomniac, by Danehill-Midnight Fever). 2017-06-09 1st Swan Hill JC Jarrod Arentz Electrical H.
2017-06-17 3rd MVRC (Moonee Valley) Embassy Print Solutions H.
Broodwar (2013.f. by Starcraft-Woppitt, by Danzero-Campbell Fever). 2017-07-04 1st Muswellbrook RC @Thebrookracing on Twitter H.
Dunga's Dude (2012.g. by Onemorenomore-Film School, by Encosta de Lago-Midnight Ballet). 2017-06-10 1st Swan Hill JC Think Water H.
Little Wealth (2012.c. by Ad Valorem-Little Madame, by Octagonal-Insomniac). 2017-06-24 1st Toowoomba TC #HappyengagementLukeandLetisha H.
Vladivostok (2013.g. by Master of Design-Marinov, by Zabeel-Storm at Midnight). 2017-07-02 1st Sale TC Stratford on the River Tourist Park Maiden P.
Conarchie (2011.g. by Time Thief-Quadrunner, by Zeditave-Quadrophonic Sound). 2017-06-24 2nd ATC (Randwick) Tamworth Professionals H.
Noviero (2014.g. by Pierro-Bridal Veil, by Haradasun-Niagara Falls). 2017-06-28 1st ATC (Warwick Farm) All Too Hard at Vinery Maiden 2YO P.
2017-06-14 2nd ATC (Canterbury) TAB Rewards Maiden 2YO P.
Wilker (2012.g. by Nicconi-Queen of the Falls, by General Nediym-Niagara Falls). 2017-06-25 1st Julia Creek TC Elrose and Elders H.
2017-07-12 1st HKJC Sweet Orange H.
Montauk (2012.g. by More Than Ready-Diamond Cove, by Octagonal-Eliza Cove). Toruk - King Genki (H.K.) (2012.g. by Arcano-Celestina Agostino, by Street Cry-Chelsey Dancer). 2017-05-31 1st HKJC Cafeteria H.
Wide Acclaim (2012.g. by Congrats-Dirty, by Hussonet-Weaver of Words). 2017-06-12 1st ATC (Warwick Farm) TAB H.
Gee Pee Ess (2010.g. by Henrythenavigator-Huntington Beach, by Flying Spur-Twist My Heart). 2017-06-18 1st Port Hedland TC North West Liquor H.
Chin Strap (2013.g. by Helmet-Pilbara Sand, by Encosta de Lago-Modellista). 2017-06-28 1st WATC (Belmont) Corporate Membership H.
2017-07-12 1st WATC (Belmont) Leith Putland H.
Parlay Vous (2013.g. by Jimmy Choux-My Parlay, by Flying Spur-Good Faith). 2017-07-08 3rd ATC (Warwick Farm) McGrath Estate Agents H.
2017-06-10 3rd Richmond TC Rising Sun Honda P.
Noire (2013.f. by Foxwedge-Valadon, by Woodman-Valourina). 2017-06-21 1st ATC (Canterbury) PKF Sydney H.
Enticing Star (2013.f. by Testa Rossa-Favourite Star, by More Than Ready-Lady Ashford). 2017-07-19 1st WATC (Belmont) Salinger H.
2017-06-29 1st Pinjarra RC 100 Club Join Now Maiden P.
Galaxy Star (2012.f. by Redoute's Choice-Galaxy Queen, by Jeune-Lady Ashford). 2017-07-01 1st WATC (Belmont) David Grays Aglink H.
More Than Alright (2012.f. by Lookin at Lucky-Retrace, by Marscay-Rewhite). 2017-07-21 1st Dubbo TC Furney's Building Industries Maiden H.
Zoology (2014.g. by Zizou-Shantha's Girl, by Redoute's Choice-Sky Cuddle). 2017-07-13 2nd Ballarat TC RU Advertising 2YO Maiden P.
Saipan (2012.g. by Saint Thomas-Church on Sunday, by Bubble Gum Fellow-Will Fly). 2017-06-16 1st Toowoomba Region H.
2017-06-20 2nd Townsville TC Become a Member Today H.
King Kazou (2011.g. by Zizou-Tenant's Tiara, by Beautiful Crown-Maintenant). 2017-07-01 1st Darwin TC Roofclad H.
BE BEE (2014.g. by Showcasing-My Other Woman, by Fusaichi Pegasus-Burst). 2017-06-26 1st Singapore TC Restricted Maiden S.
Snow Fields (2013.f. by Northern Meteor-Perisher Valley, by Devil's Bag-Milezka). 2017-07-14 1st Ipswich TC (Ipswich) Sirromet H.
Casual Diamond (2014.f. by Var-Casual Jewel, by Al Mufti-Antonia's Gold). 2017-06-10 1st Kenilworth Maiden Juvenile P.
2017-06-28 1st Kenilworth Juvenile P.
French Skyline (2014.f. by Manhattan Rain-La Lagune, by Danehill-Commercial Choice). 2017-07-21 1st Geelong RC Bet365 Maiden 2YO P.
Brahmos (2013.g. by Smart Missile-Jannah, by Carnegie-Significant Moment). 2017-07-19 1st MRC (Sandown) Resimax Group H.
GAZIBORA KHAN (2014.c. by Native Khan-Enhance, by Entrepreneur-Charming Life). MISS PLANET (2015.f. by Native Khan-White Lily, by Shining Wolf-Enhance). ZODIAC RULER (2013.c. by Zoffany-Sybarite, by Last Tycoon-Procrastinate). Visit the Turangga Farm website. View all lots Turangga Farm has in this sale.